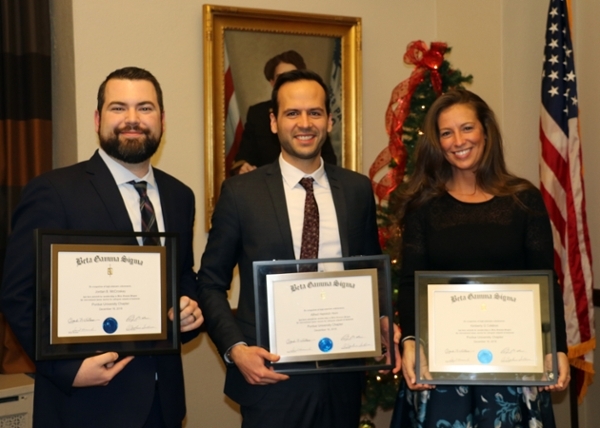 Congratulations to the IMM Global Executive MBA Class of 2018, which celebrated graduation with a dinner and awards ceremony at Purdue in mid-December. Beta Gamma Sigma, or top 20% of the cohort, nominees were honored. They are, from left, Jordan McCroskey, Freddy Horn, and Kim Coldiron. Freddy was also named the cohort's Krannert Scholar, having the hightest GPA in his class. The class of accomplished professionals traveled to seven countries on four continents together, studying in Europe, South America, China and the U.S. They earned two MBAs in 19 months -- one from Purdue and one from partner school Tilburg University in The Netherlands. The class voted Dr. Filip Caeldries Outstanding Professor, and gave Dr. Thomas Eppel the Excellence in Teaching award. The vast majority of the cohort traveled back to West Lafayette for graduation with family and friends in attendance. We extend a big Boiler Up! to the newest members of the Purdue alumni family. Hot off the presses! The new Purdue Executive newsletter highlights our new IMM Global EMBA program school; alumni accomplishments; Weiler Lounge's makeover; our Economist rankings; and much more! Read the top 5 digital marketing techniques you should be taking advantage of and an update from Purdue EMBA Programs' executive director. See photos from our on-campus residencies, and learn more about our two recent cohorts. Plus, find alumni events and learn how to stay connected to Krannert. The Purdue Executive is a newsletter for the alumni and friends of the Krannert Executive Education Programs at Purdue University. Alumni: We welcome your good news for the Alumni Notes section anytime! Email krannertexec@purdue.edu. 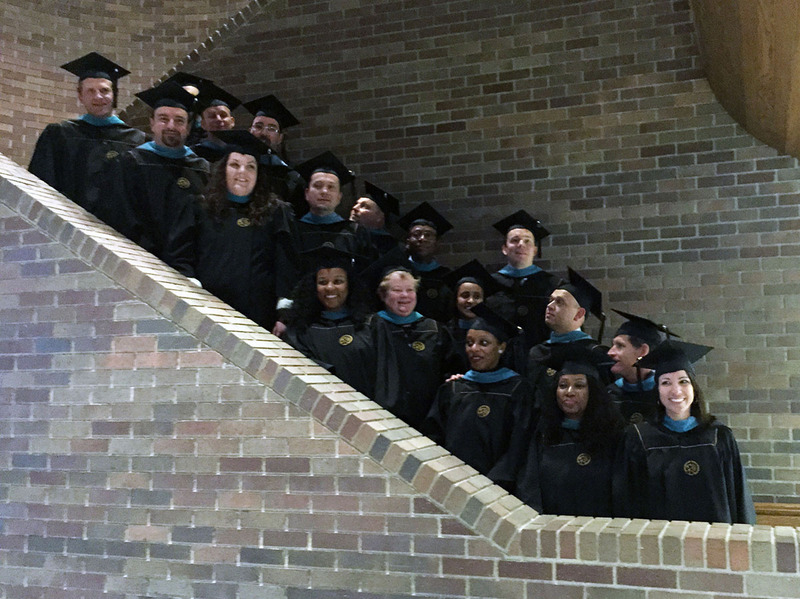 In May we celebrated the graduation of our Executive MBA Class of 2018, a cohort representing 10 U.S. states; companies including PwC, Nestle, Amazon, Whirlpool, Rea Magnet Wire, and more; 14 years' of work experience on average; and five U.S. veterans: Tim Browning, John Carr, Karie Linn, Nick Warden and Kyle Williams. The majority of the class made it back to campus for graduation festivities, which included a dinner for the graduates and their loved ones in the Purdue Memorial Union. Beta Gamma Sigma, or top 20% of the cohort, nominees were honored. They are Eric Bilinski, Lucy Houchin, Arunashish Majumdar, Heng Tong Pit, Matthew Stowe, and Robert Ulibarri. Eric Bilinski was also acknowledged as the Class of 2018's Honor Scholar, having the highest GPA in the group. The students voted on top faculty -- Excellence in Teaching went to Dr. Thomas Eppel, and Outstanding Professor was awarded to Krannert Associate Professor Ben Dunford. 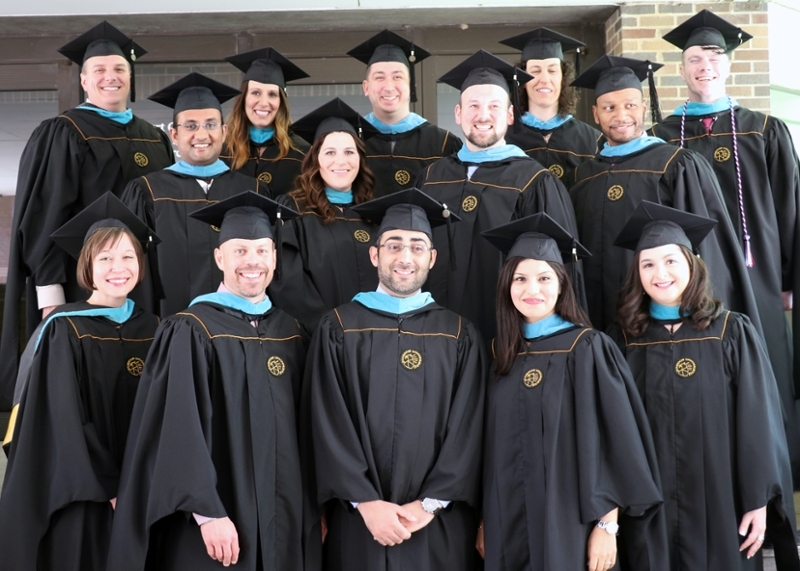 We congratulate our EMBA Class of 2018, and commend them for accomplishing so much in 19 months. Boiler Up! All Krannert alumni -- and current Purdue Executive MBA students -- are invited to join the Krannert Network to connect with fellow Boilermakers and to use the trusted Krannert environment to expand professional networks. Find a mentor, become a mentor, get advice, learn about upcoming events and more when you join Krannert Network. Signing in is easy when you use your LinkedIn or Facebook account. Seeking further engagement opportunities at Krannert? Contact our External Relations team today. Lastly, be sure to find Krannert Executive Education Programs on Facebook, and an IMM program-specific Facebook page here. Follow us on LinkedIn for industry news, networking opportunities, and more. Congratulations to our newest graduates, the IMM Class of 2017! This group of professionals, hailing from seven countries, was the first to study in Vilnius, Lithuania, as part of the IMM program. This cohort was also 50% female, a first for the Purdue program and a rarity for EMBA programs around the world. IMM 2017 students traveled -- with friends and family -- from across the globe to attend graduation festivites at Purdue in mid-December. Dr. Thomas Eppel was named Outstanding Professor by the class, and Dr. Filip Caeldries and Dr. Ron Lazer were given Excellence in Teaching awards. 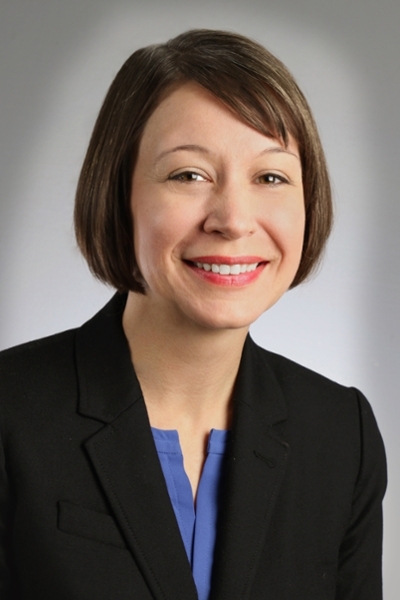 The Krannert Scholar -- or highest academic achievement in the class -- was Wendy Teare, a senior program manager at the Boeing Co.
Read more about this amazing group in our Krannert Magazine feature. For the third consecutive year, a Purdue EMBA student has been featured in Poets & Quants' list of the year's Best EMBAs. For 2017, the online resource featured Purdue EMBA Class of 2017's Courtney Metzger. Courtney is a manager at Kenergy Corp. who, in her "free time," serves as a CEO for a properties LLC; as a CFO to a holdings firm; and consults pro bono for several businesses in northwestern Kentucky. She graduated from Purdue in May 2017 and was her cohort's Honor Scholar. She says she knew the Purdue EMBA Program was a fit for her due to our format. "I did not want to pursue a program only offered online, as networking was important to me. Additionally, due to my geographic location, traveling every weekend would have been a major challenge." Courtney's focus on networking paid off. Asked what she enjoyed most about business school, she said, "I enjoyed getting to know the members of my cohort the most. Our group had an almost instantaneous connection. In both the class setting, during virtual meetings and even during the long hours we shared in breakout rooms, they taught me a lot from their own experience. They also helped me find and work on some of my growth edges. Through this program, I have made life-long friends. I feel extremely fortunate to have learned from such an accomplished group." Read her full Poets & Quants 2017 Best EMBAs profile online. On May 12 we celebrated the commencement of our EMBA Class of 2017 with a dinner for the students and their family members and friends, and an awards ceremony with speaker David Hummels, Krannert's dean, and student responder Brianne Keyes. More than half the cohort traveled to campus for the graduation ceremony at Purdue's Elliott Hall of Music. At our celebration in the Purdue Memorial Union following the official ceremony, Purdue EMBA Programs recognized the EMBA 2017 Beta Gamma Sigma -- or top 20% of the class -- members: Kriti Chandhoke, Brianne Keyes, Ryan Laskey, and Courtney Metzger. Special recognition was also given to the cohort's Honor Scholar, Courtney Metzger, and to Peter Rusch, for his military service. As student responder, Brianne Keyes shared lessons learned (some unexpected) and images from the cohort's 19 months together. EMBA Senior Program Manager Donna Steele shared with the room the top faculty, as voted on by the students. Accounting professor Dr. Ron Lazer was voted Outstanding Professor, and Dr. Thomas Eppel was recognized for Excellence in Teaching. We congratulate our newest Boilermakers on earning their Executive MBA from Purdue, and look forward to engaging with them as alumni. Krannert Executive Education Programs hosted its annual Back to School day on May 5, 2017, for Krannert alumni. Evidence of our commitment to lifelong learning, this full day of classes and networking was at no charge to our alums. Twenty-four alums from across the country traveled to Purdue for this year's event. Included in that group were Executive MBA alumni from the Classes of 2006, 2007, 2009, 2010, 2011, 2012, and 2015. Courses offered covered Leadership; the U.S. economic outlook and policy challenges; and the importance of an Executive Presence, or how to construct effective presentations, using both non-verbal/verbal communication to influence an audience. 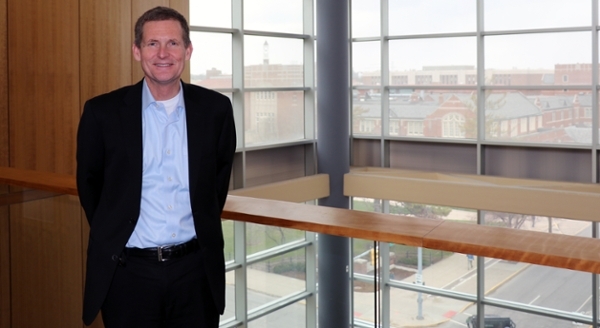 The three 90-minute sessions were taught by renowned Krannert faculty. Alums were able to network during breakfast and lunch, and mingled with current EMBA students -- the EMBA Class of 2018 was in residency. We capped our Back to School day with a Purdue vs. Northwestern baseball game at Alexander Field. Learn more about alumni events by liking us on Facebook. Krannert alumni: Join Krannert Network to stay up-to-date on events and more. 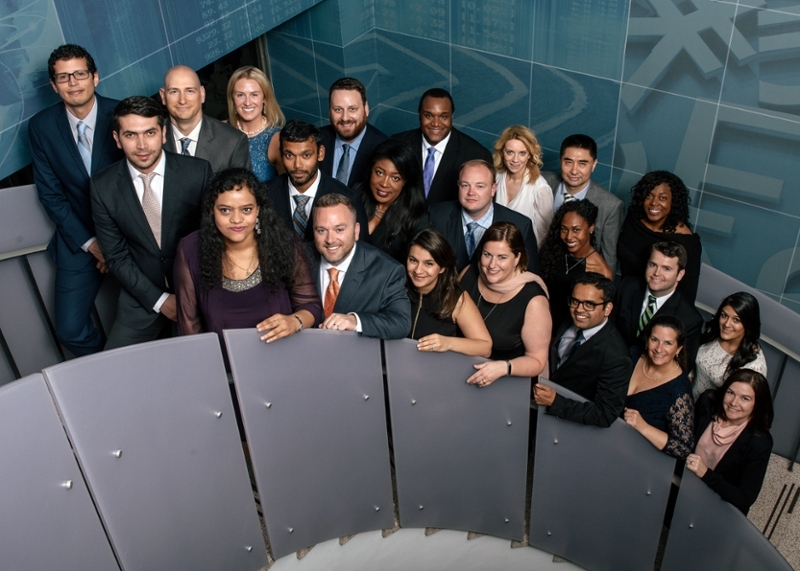 In December 2016 we celebrated the graduation of our IMM Global EMBA Class of 2016. Members of the cohort, who had studied in seven countries on four continents, braved icy weather to return to Purdue for the university's graduation ceremony and a dinner for the students and their family and friends in the Union. Students who graduate from the IMM program earn two MBA degrees, one from Purdue and one from a European partner school. We congratulate our newest graduates and welcome them to the Purdue alumni family. Boiler Up! On Friday, May 6, we welcomed Krannert alumni to Krannert Center for Back to School 2016, a full day of classes and networking with fellow alumni and current Executive MBA students. The annual event promotes lifelong learning by offering graduate-level courses at no cost to our alumni. This year's Back to School featured a career management workshop by guest speaker Ginny Clarke; Dr. Karthik Kannan's class, Digitization and Information Flows: How will the Internet of Things and Big Data Transform our World? ; and Dr. Ben Dunford's session on leadership. We capped the day with a tour of Purdue athletic facilities and a reception in Mackey Arena's Spurgeon Club. Stay tuned to this page for information on Back to School 2017. The alumni event is held the first week of May each year. Some of the alumni attending Back to School 2016 are seen here in front of Krannert Center during a break in the day's schedule. Purdue EMBA Programs alumna Stacey Mueller is one of Poets & Quants' top 30 most exceptional executive MBA graduates from the Class of 2015. Graduating with a near perfect GPA, Stacey was top 5% of her graduating cohort. The Montana resident is CFO of Blackfoot Telecommunications Group, which she "pursued and landed as a result of the MBA experience." "My goal is to replace our current CEO when he retires, and lead from that chair," Stacey says. Read more about Stacey on Poets & Quants. 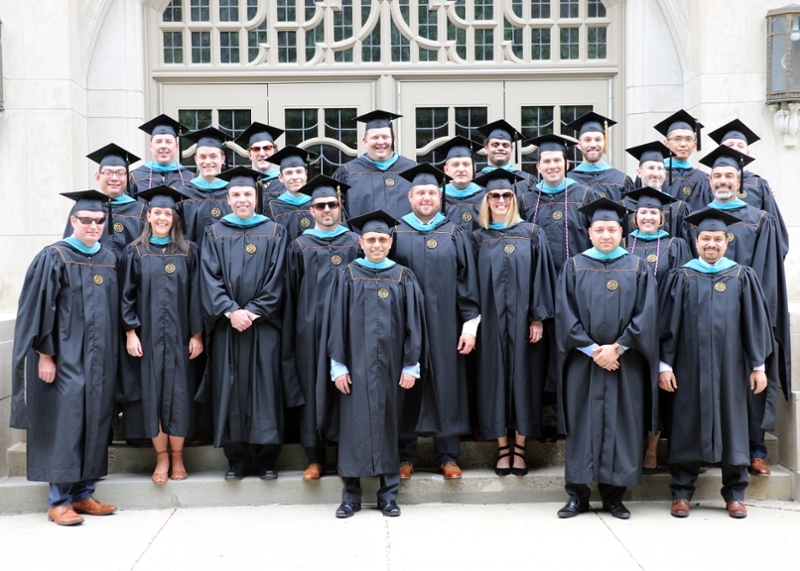 We congratulate the EMBA Class of 2015 on their graduation from Purdue. Members of EMBA 2015 traveled to campus May 15 to celebrate with their family and friends at the Union and Elliott Hall of Music. During the executive education dinner guests heard from student responder Greg Beaver. Beta Gamma Sigma (top 20% of the class) recognitions were awarded to Jeeva Babu, Khurram Chaudhry, LaToya Davis, Jeff Hirsch, Brent Myers, and Stacey Mueller, who was also named Honor Scholar (top 5% of the class). It has been a rewarding 19 months, and we wish our new alums much success. 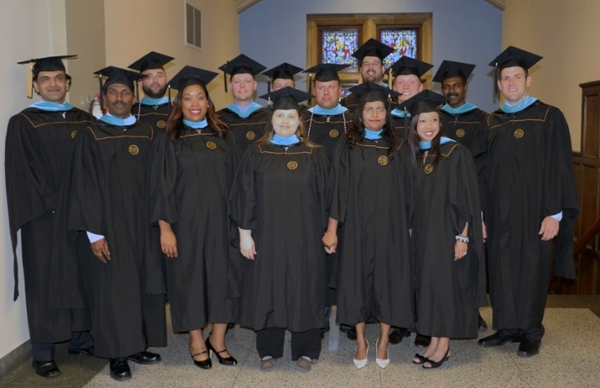 Members of the EMBA Class of 2015 pose in their graduation garb at Purdue's Union Club Hotel. 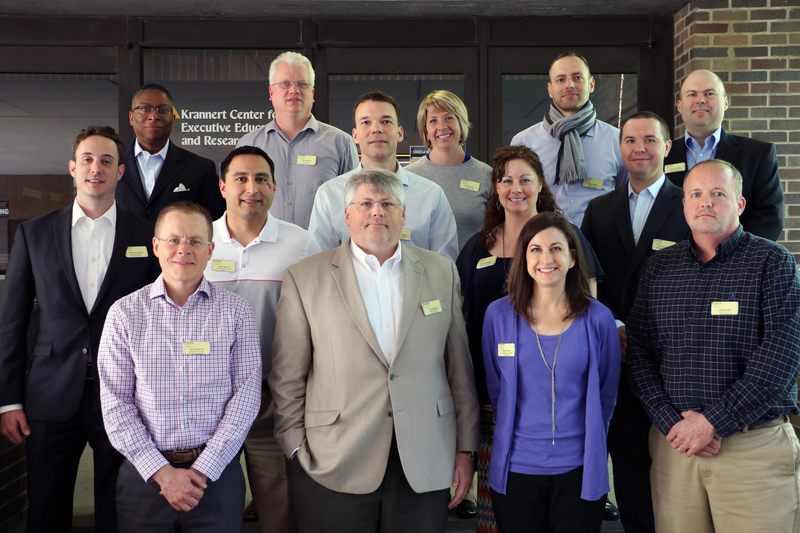 Executive Education welcomed more than 30 Krannert alumni Back to School on May 8 for a full day of classes and networking in Krannert Center. 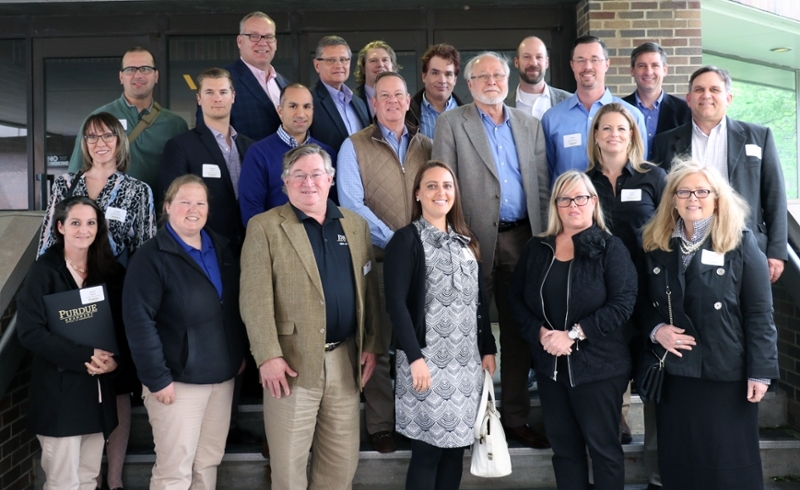 The group, made up of EMBA, IMM Global EMBA, and Krannert undergraduate degree earners, attended lectures on global competency; the importance of trust in leadership; and the critical issue of industrial knowledge loss associated with the retirement of 10,000 Baby Boomers a day. The full day of classes, good food and networking was capped by a wine presentation and tasting in Purdue's Enology Library. Alumni also were able to engage with our EMBA Class of 2016, in residency that week. We thank our alumni for coming back to class. Executive MBA alums: Look for your invitation to Back to School Day 2016 next spring! Krannert alumni gathered May 8 for a full day of classes during Back to School 2015. Krannert welcomed EMBA Class of 1997 alumnus Todd Hyatt back to campus in late March 2015 as a Krannert Executive Forum speaker. The Forum is a management class that features top-level executives and community leaders sharing their experiences with students. It has been a valuable addition to Krannert's management curriculum since 1973. Todd is the Executive Vice President and CFO of IHS in Englewood, Colorado. Todd talks about his experiences as a Purdue EMBA student and the benefits of his executive education in this testimonial. EMBA 1997 alumnus Todd Hyatt spent two days at Krannert interacting with students as a Krannert Executive Forum speaker. Paul Ryder, EMS 1994, returned to Purdue on February 3, 2015, to announce, along with university President Mitch Daniels, the grand opening of Amazon@Purdue. Read more and find a link to a video of the opening ceremony on News and Events. 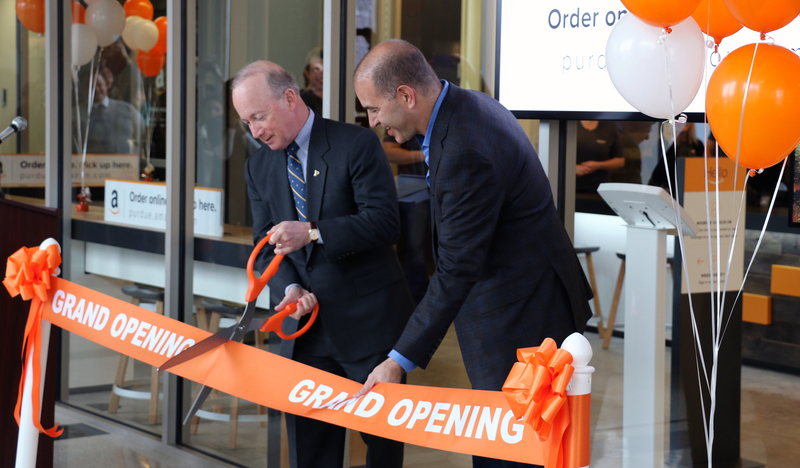 PU President Mitch Daniels and Krannert Executive Education alumnus Paul Ryder, right, cut the ribbon at the new Purdue-Amazon collaboration in the Krach Leadership Center. 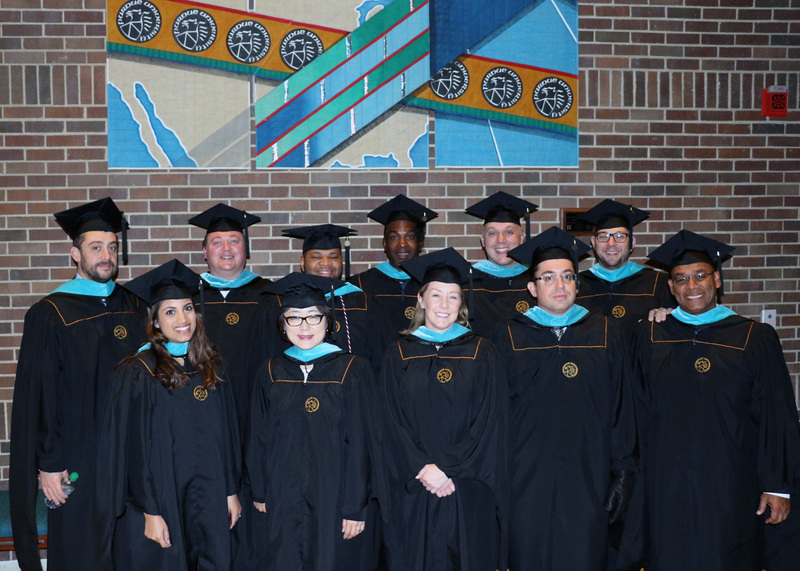 Members of our IMM Global EMBA Class of 2014 celebrated their new status as Purdue Executive MBA alumni the weekend of December 20-21, with festivities in Krannert Center and the Purdue Memorial Union and a graduation ceremony in Elliott Hall of Music. Our students traveled from around the world with their family and friends to reunite in West Lafayette. Twenty-one students graduated in the Class of 2014, with 19 able to travel back to West Lafayette for the ceremony. 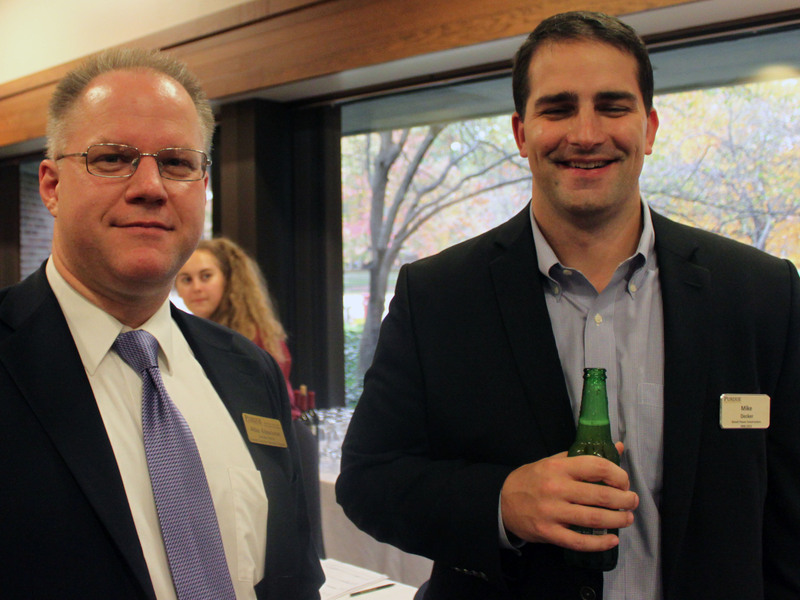 Purdue's Krannert Executive MBA program and the Krannert Professional Development Center hosted a fall 2014 Networking Event on October 23rd at Krannert Center that provided an opportunity for a select group of Purdue Corporate Partners to network with Purdue EMBA students and alumni. 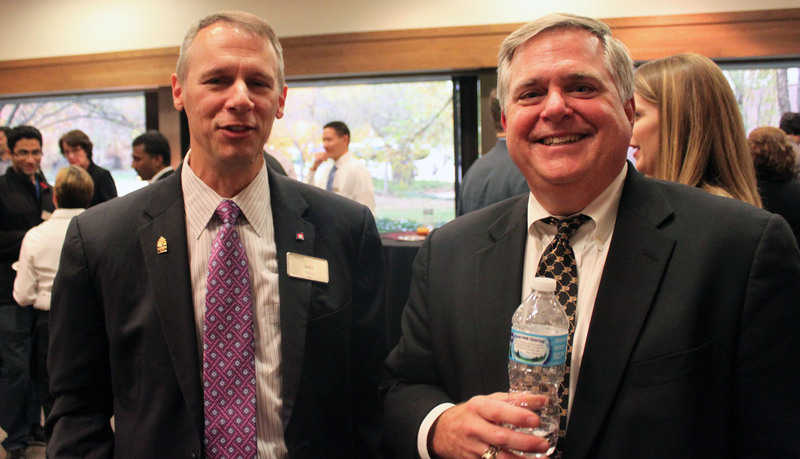 Mike Heard of CNO Financial Group, left, joins guest speaker and Krannert alumnus Matt Cohoat in Krannert Center for an alumni-networking event October 23, 2014. Matthew Cohoat, EVP and CFO of Becknell Industrial, gave an address in Krannert auditorium prior to the networking evening in Weiler Lounge. Matt Cohoat oversees the capital management and analysis of capital structure of Becknell Industrial. He is also responsible for all accounting, financial reporting, human resources and risk management. A 20-year real estate industry veteran, Mr. Cohoat is widely recognized for his management of key banking and institutional investor relationships. He received a Bachelor of Science degree in Accounting from Purdue University and is a Certified Public Accountant. Aldas Kriauciunas, executive director of Krannert Executive Education Programs, left, caught up with IMM Global EMBA alumnus Mike Decker of Kiewet Power Constructors. The networking event featured alumni, current students, Krannert faculty and special guests from CNO Financial Group, Amazon, Braunability, GE and more. We are very excited by the success of the evening, and look forward to continuing to offer these events as we increase our efforts to provide executive networking opportunities and career services to our students. After considering a variety of items to buy for their class gift, the Purdue EMBA Class of 2016 adopted a “pay it forward” approach. They initiated the Executive MBA Scholarship Fund and provided the initial capital for its creation. The class invites all alumni to contribute and support future generations. Donations can be made online. In the “Special Instructions” box, please note that the donation is for the Executive MBA Scholarship Fund. We thank you for your generosity in contributing to the success of future Purdue EMBA students. Read more about the scholarship fund and the fund's first recipient. Our Continuing Education Webinar Series provides free, online classes on a variety of research and management topics. View archived webinars and learn about upcoming series installments here. Stay up to date on upcoming learning opportunities by following Krannert Executive Education Programs on LinkedIn. All Krannert alumni are invited to join the Krannert Network to re-connect with former classmates and to use the trusted Krannert environment to expand professional networks. The Purdue University Executive MBA Programs team seeks to work with companies large and small to solve crucial business problems through our Active Learning Projects, or ALP. For our client companies, ALP is an opportunity to have accomplished professionals assist in solving a problem. Learn more about our Active Learning Projects here, and contact Director of Business Development Sally Meech at 765-494-7801 or sally@purdue.edu with questions.